(a). Hon. Agbonayinma Johnson brought a petition from a constituent against the Nigeria Customs for improper disengagement. (b) He brought another from someone else petitioning the Nigeria Police for abuse of Office. (c) He also presented another petition on the dispute of pipeline between two Urhobo communities. Petitions referred to the House Committee on Public Petitions. Hon. Kolade Victor Moved the Motion on the ravaging of diverse properties in the communities of his constituency by a rainstorm. He urged N.E.M.A to as a matter of urgency provide relief for the victims and asked the House Committee on Disaster Management to ensure compliance. As a disaster-related Motion, it was voted on and Passed. Hon. Beni Lar Moved the Motion on some villages in Langtan North who are engaged in lingering crisis. Armed bandits entered the communities inflicting mayhem on lives and properties in the communities. She called for the deployment of a Special Task Force to secure the region. She also called on N.E.M.A to send relief to the affected victims and help rebuild the scores of houses in the communities. National Health Insurance Act (Amendment) Bill, 2018 (HB. 1465) (Hon. Anayo Nnebe) – First Reading. National Small Scale Business Development Loan Scheme Bill, 2018 (HB. 1466) (Hon. Anayo Nnebe) – First Reading. Immigration and Prisons Services Board Act (Amendment) Bill, 2018(HB. 1467) (Hon. Anayo Nnebe) – First Reading. Chartered Institute of Loss Adjusters of Nigeria (Establishment) Bill, 2018(HB. 1468) (Hon. Soyinka Abiola Olatunji) – First Reading. Federal College of Education, Technical Ikare-Akoko (Establishment) Bill, 2018(HB. 1469) (Hon. Olemija Stephen Friday and 3Others) – First Reading. A Bill for an Act to Amend the provisions of the Electoral Act, No. 6, 2010 to further Improve the Electoral Process and for Related Matters (HB.1425) (Hon. Aishatu Jibril Dukku, Hon. Ahmed Babba Kaita and Hon. Eucharia Azodo) – Second Reading. Hon. Aishatu Dukku Moved for the Second Reading of the Bill, it was Seconded by Hon. Galadima Zakari. In leading the Debate Hon. Dukku stated that the Bill was an amendment and consolidation often individual Bills aimed at consolidating on the gains of the 2015 General Elections and ensure improved electoral process in the country. Among the Amendments proposed by the Bill include clarifying the status of candidacy of an aspirant that dies before the election process is concluded, what happens in the case a winner of an election is later disqualified on genuine grounds, strengthening internal democracy within political parties, to clarify the status of voting for Nigerians living in the diaspora, to sanitize the conduct within the process of the Electoral Tribunal etc. Hon. Tahir Monguno in supporting the Bill stated that there exists a lot of lacuna in the Electoral Act as it is now, and the Amendments are aimed to bring the Act to the standard of the current times. Hon. Onyejeocha Nkeiruka spoke against some aspects of the Bill, she cited the clause that stipulated that a winner can be disqualified if the electoral process is flawed, who proves the violence was caused by the winner? And gives them too much power to the Courts. Hon. Nnenna Ukeje stated that the Bill is so serious to be passed trivially. She cited some aspects she thought to be too vague, especially the aspect that deals with diaspora voting as even I.N.E.C confess not to have the capacity to handle diaspora voting, especially as the Embassies agree that they do not have the database of Nigerians living abroad. She suggested like Hon. Onyejeocha Nkeiruka that the Bill be stepped down and reworked. Hon. Madaki Aliyu supported the Bill on the aspect of the electoral process it seeks to clean up. Hon. Nicholas Ossai opposed the Bill on the ground that it contradicts the ECOWAS Convention that stipulates that there should not be any amendment to an Electoral Act or process 6 months before General Elections. The Speaker stated that there must be an Electoral Act in place before elections. He stated that there is ample time to correct any abnormalities during the Public Hearing stage. The Bill was put to a vote, Passed for Second Reading and referred to the House Committee of the Whole. A Bill for an Act to Establish Federal College of Education, Obot Akara, Akwa Ibom State, to Provide Full-Time Courses, Teaching Instruction and Training in Technology, Applied Science, Arts, Social Sciences, Humanities and Management; and for Related Matters (HB. 1339) (Hon. Emmanuel Akpan) – Second Reading. Hon. Akpan Moved for the Second Reading of the Bill and it was Seconded by Hon. Jarigbe Agom. In leading the Debate Hon. Akpan stated that the establishment of the College would be for the achieving of excellence in knowledge standards, even for qualified teachers. The Bill was put to a vote and Passed for Second Reading and referred to the House Committee on Tertiary Education and Services. Concerned that despite the havoc wreaked on the Community neither the Lagos State Government nor the Federal Government has come to the aid of the affected Community in any form even though an appeal was made to the National Emergency Management Agency (NEMA) to that effect vide a letter dated 17 November 2016. (iv)Mandate the Committee on Emergency and Disaster Preparedness to ensure compliance. As a disaster related Motion, it was voted on and Passed. (iii) hosted World Pension Summit in the years 2014, 2015 and 2016 respectively where it was alleged that over two Billion naira was spent. Mandate Committees on Public Procurement and Pensions to investigate the allegations and report back to the House within six (6) further legislative action. Hon. Zakariya’u Galadima Moved the Motion and it was Seconded by Hon. Solomon Mahren. As an Investigative Motion, it was put to a vote and Passed. (iii) recommend the prosecution of FCT Officers found culpable in the breach of such procedure and report back within eight (8) weeks for further legislative action. Hon. Bashir Baballe Moved the Motion and it was Seconded by Hon. Mahmoud Mohammed. Hon. Baballe stated that some of the process of allocation of the land within the stipulated time smacks of a lot of irregularities. 2010 stands out as a notorious year within the period under review where a microscopic number of allocated land was developed and many of the indigenous residents of the F.C.T were unduly denied access to their ancestral lands. As an Investigative Motion, it was put to a vote and Passed. Further notes that the unfair labour practices include refusal to pay salaries, match bonuses as agreed, lack of good medical services, denial of players’ copies of their contract, etc. (ii) investigate the cases of failure to enforce Nigeria Football Federation (NFF) players’ arbitration decisions, which has made it impossible for many players to get paid as ordered by the Nigerian Football Federation. Hon. Ayo Omidiran Moved the Motion and it was Seconded by Hon. Ibrahim Musa. In leading the debate, Hon. Omidiran stated that all other means of amicably resolving the issue have failed. The players have therefore come to the House of Representatives for succor. She pointed to this kind of practice as one of the reasons why the Nigerian league is not developing at the rate it should with the necessary endorsements and inputs in place. Hon. Zakari Mohammed contributed that the private sector should be encouraged to participate in sports development. He asked the relevant Agency to ensure the market is well structured. Hon. Nuhu Danburam stated that all Clubs should be made to set up a bond so that players’ salaries can be drawn from such bonds in the case of deferring clubs. (iv) mandate the Committees on Diaspora and Foreign Affairs to ensure implementation. Hon. Nkeiruka Onyejeocha Moved the Motion and it was Seconded by Hon. Goni Bukar. Hon. Nkeiruka Onyejeocha in leading the debate stated that Nigerians living in South Africa live in constant fear. She reminded the House that even though a High-Powered Committee was set up to commiserate with the Nigerians there and advice them on peaceful coexistence with their hosts. She stated that apparently this advice could not be adhered to as they are constantly harassed indiscriminately, and their hosts are not peace-promoting. Hon. Shehu Shagari in supporting the Motion recalled how he used to go to secondary school with South Africans who were orphaned as a result of Apartheid and how nice Nigerians were to them. He stipulated that something drastic should be done and if it is still not satisfactory, then South African interests in Nigeria should be boycotted. Hon. Rita Orji lamented that Motions and complaints seem not to be working. She stated that Nigerians have become endangered species in South Africa due to the failure of the system that should be protecting citizens living within the land. She blamed the South African Government for not doing enough to ensure the safety of foreigners. Hon. Shehu Aliyu stated that the root courses of the xenophobia that has become a recurring decimal have defied solution. He hoped it would not come to the situation of retaliation. Hon. Nnenna Ukeje stated that the problem should be properly diagnosed before treatment can be applied. She stated that even though the Governments of Nigeria and South Africa are friendly; that fondness does not trickle down to the citizens. She wondered that beyond constant engagement, what can Nigeria do? She also stated that the legal system of South Africa was weak and prosecution was difficult as most victims do not turn up in court due to fear of further attacks. The Motion was put to a vote and Passed. (iv) Mandate the Committees on Police Affairs, Federal Judiciary and Justice to ensure full compliance. Hon. Ezekiel Adaji Moved the Motion and it was Seconded by Hon. Joseph Ayodeji. Hon. Adaji in leading the debate stated that the Motion was principally aimed to ensure the Nigerian society does not slip into anarchy through the continuation of this practice. He stated also that it is also possible for the wrong victims to be attacked as heightened emotions does not mostly allow for clear-headed investigations. The Motion was put to a vote and Passed. The House: Recalls that on Thursday, 27 March, 2018, the House constituted an Ad-hoc Committee to investigate the legality and modus operandi of the Special Presidential Investigation Panel (SPIP); Aware of the expansive nature of the assignment which include investigation on the deployment of personnel from various Agencies of Government and the Nigeria Police Force to the SPIP; Further aware of complaints from concerned citizens and petitions against the questionable conduct and character of the Chairman of the Panel; Desirous of the need to do a thorough job on the assignment with a view to getting all the material facts surrounding the matter so as to gather enough data and information for proper analysis and actions taken by the Panel; Cognisant of the sensitive and technical nature of the task, which requires inputs from members of the Panel, and the general public and considering the expected time to complete the assignment; Mindful of the extant provision of Order Seventeen, Rule 3 (1) (g) of the Standing Orders of the House. Resolves to: Grant the Ad-hoc Committee additional six (6) weeks to enable it to complete its work and submit the report for further legislative action. Hon. Pategi in leading the debate stated that extensive steps need to be taken as the Chairperson of the Panel has been very unresponsive and the investigations that were referred to them by the Vice President has gone rogue. The Motion was put to a vote and Passed. “That the House do consider the Report of the Conference Committee on the Appropriations Bill, 2018 and approve the recommendations therein”. At the Conference Committee, the Senate and House Members were able to seamlessly come to agreements on the deferring clauses and adopted them all. The Report was voted on and Adopted. 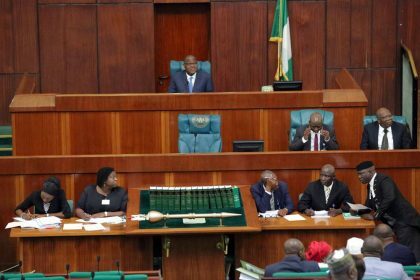 “That the House do consider the Report of the Conference Committee on a Bill for an Act to ensure full Integration of Nigerians with Disability into the Society and Establish a National Commission and Vest it with Responsibilities for their education, Healthcare, Social, Economic and Civil Rights and for Related Matters and approve the recommendations therein”. Hon. Orke Jev stated that The House and the Senate had come together and harmonized the Report and he urged the Members of the House to adopt the Report. It was put to a vote, Passed and Adopted. (ii) that all his salaries and entitlements be paid to him. Urge the Abuja Municipal Area Council to relocate Patrick Ogbonna as his sixteen self-contained rooms which were illegally demolished without given any notice and has paid all the necessary fees. “That the House do consider the Report of the Committee on Public Petitions on the Petition by Canice Nweke Chidinma against the National Drug Law Enforcement Agency (NDLEA) on the unlawful termination of his appointment by the Management of the Agency and approve the recommendation therein” (Laid: 15/5/2018). Urge the Chairman/Chief Executive of the NDLEA to reinstate Mr. Canice Nweke Chidinma back to the service of NDLEA as due process was not followed in the termination and he should be promoted to be at par with his colleagues in Office as well as paying the arears of his salaries, benefits and entitlements. Older PostPlenary Proceedings of the House of Representatives for Wednesday, May 23, 2018.